Sylvanian Families are an adorable range of distinctive animal characters with charming and beautiful homes, furniture and accessories. They live, work and play in the idyllic and wonderful land of Sylvania. 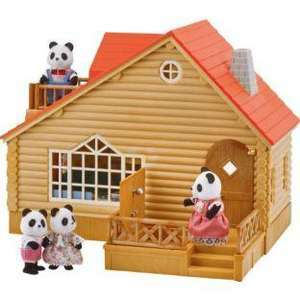 The Log Cabin is the Sylvanians’ favourite holiday hideaway. Tucked away in the woods, it is a special place for holidays with friends and family in summer sun or winter snow. The cabin is packed with lovely features; hammocks to sleep in, a sun deck for lounging and a hot tub for relaxing in after a busy day in Sylvania! To extend your log cabin you can place the Treehouse next to it and use the side or ladder to connect the two together. The log cabin contains steps with hot tub, two hammocks and a ladder for endless fun! ■ Log Cabin dimensions H27cm x W36cm x L18cm. I have 2 sheds..... and a log cabin. Great price, thanks for the post, ordered and heat added. That's one of my 2013 crimbo presents sorted.